As a planner, I am often approached with the question, of “What is a good wedding favor to give to my guests? The answer I give varies from couple to couple, and wedding themes or colors. While it’s not so tricky to find great wedding favors, couples need to be careful, because favors can often be overlooked by guests, and left at the end of the night for the bride and groom to take home. I believe a good wedding favor, should be functional in one way or another, creative, and fun! I have decided to put together a list of successful favors I have seen in the past weddings here at Gala, along with fun ideas I have seen from other weddings! For wedding ceremonies that are held outside in the summer months, fans are useful wedding favors. 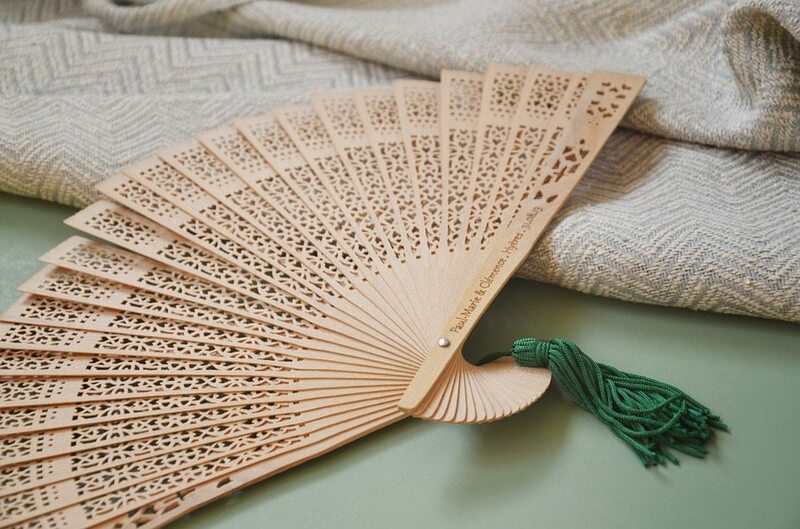 Fans can easily be personalized, with your wedding date and colors, but also be used by guests to keep them cool! They can be a fun “Do It Yourself” Project, or you can order them in bulk from many different wedding websites. Additional bonuses that come along with this favor, is you can also double them as your wedding programs, and they make fun props for wedding pictures! At Gala Event Facility, we have had many of our couples choose to give away koozies, as their wedding favors! In my opinion koozies are a great hit, and liked by both the male and female guests. With koozies you can print messages on both sides, and if you have beer cans or any canned drinks, guests can start using your favors on your wedding night! A popular choice of favors among couples is to give away candy! Not only is this a sweet treat for your guests, but it also allows you to be very creative! At Gala we have had brides create candy stations, where guests can have that nostalgic feeling of being a kid in a candy shop again, creating their own take away goodie bags! We have also had couples who have enhanced their table-setting, by bringing in the most creative containers and boxes of candy that guests can take with them after the reception. Below I have listed some unique ideas for wedding favors, I have found! Please share any new ideas!